October 7, 2015 by Lynette M. Fraga, Ph.D.
As we settle into our fall schedules and wait for the changing of the leaves here in Northern Virginia, I always feel a little nostalgic for the warm months of summer. CCAoA’s Healthy Child Care, Healthy Communities project is currently reviewing applications and selecting participants. This Robert Wood Johnson Foundation-supported project provides two years of technical assistance from Child Care Aware® of America to 6 selected state groups on incorporating child health, nutrition and obesity prevention in child care plans. Participant selection is underway and will be announced in mid-October. We’re looking forward to our first meeting in November 2015. Stay tuned for more information. CCAoA’s Bonnie Storm Senior Director, Exceptional Family Member Program (EFMP), attended the Elizabeth Dole Foundation’s Respite Council Working Group meeting in Washington, D.C. on September 15 and brought back a wealth of knowledge from other respite care workers and programs. Child Care Aware® of America participated in the 2015 Biennial NICCA Conference at the Washington Court Hotel in Washington, D.C. Members from the public policy team presented Capitol Hill advocacy strategies that included how to advocate and have successful meetings with members of Congress and staff. The team also provided support to NICCA and advocates for their ‘Day On The Hill’ to advocate for CCDBG funding. 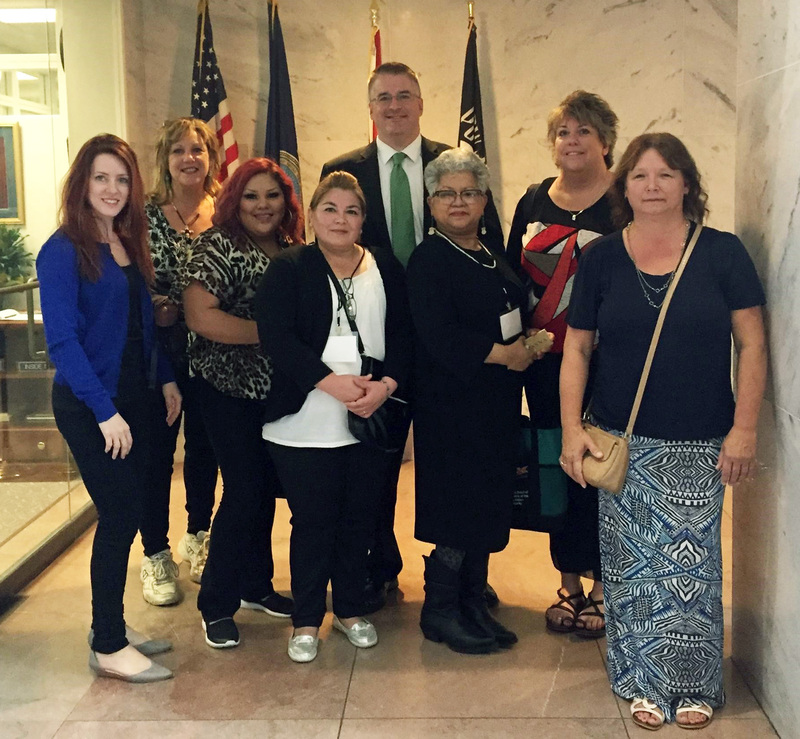 Jay Nichols, CCAoA’s director federal policy and governmental affairs, on the Hill with some of the dedicated NICCA advocates. We were proud to stand alongside Head Start and other organizations supporting the early education of our children. On September 29, CCAoA hosted its fourth CCDBG Implementation Station webinar highlighting the health, nutrition, and obesity prevention opportunities and mandates under the new law. The webinar was hosted by Jay Nichols and Krista Scott of CCAoA, and included Julie Shuell, Project Director, Nemours National Office of Policy and Prevention, and Beverly Lynn, Chief Executive Director of Programs for Parents, Inc. in New Jersey. More than 100 attendees participated in the webinar and discussion. If you missed it, don’t worry, you can watch it on our YouTube channel. We hope to see you at the Omni Shoreham Hotel in Washington, D.C. April 4-6, 2016 for the 2016 Symposium: Celebrating Milestones, Collaborating for Results! Mark your calendars and be prepared to join in discussion on topics around policy, research, practice, and innovation. RFPs for panel topics and discussions will be coming out soon – stay tuned for more information. April Dodge-Ostendorf is joining the CCAoA team as our Family and Community Engagement intern so you may see more from her in the future. April is in her second and final year of a Master’s of Social Work program at the University of Missouri Kansas City. She has worked for the Missouri Children’s Division since 2004 where she has gained a wealth of on-the-ground experience related to foster care programming and child services. She has a heart for serving vulnerable children and families and is a remarkable, well-rounded and highly motivated person. April works remotely in the Kansas City area with Dr. Kim Engelman, Child Care Aware® of America’s Senior Advisor and Director of Family and Community Engagement. April’s internship with Child Care Aware of America will span the 2015-2016 academic year. MSN had an interesting article on how salary experts would calculate the value of stay-at-home mothers. Of course this includes the cost of child care, citing data from CCAoA’s 2014 Cost of Care Report. Check it out to see what else they included in their calculations. This entry was posted in child care, congress, working families. Bookmark the permalink.